The head-smacking logic was explained in detail by The Guardian this weekend. I'll admit, it still doesn't totally make sense to me, but there's the rationale. Transport for London is seeing record-high numbers of passengers, which leads to some stations (namely the older, more antiquated ones) becoming overwhelmed with bodies during rush hour. Escalators naturally create bottlenecks when all those people are squeezed into narrower paths, so you'd think that it would improve congestion for the faster-moving people to go ahead and slip past the slower-moving people. 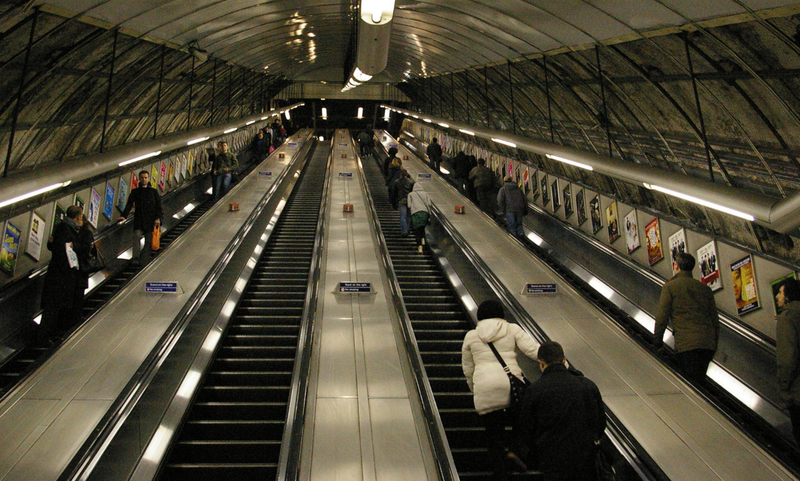 A 2002 study of escalator capacity on the Underground found that on machines such as those at Holborn, with a vertical height of 24 metres, only 40% would even contemplate it. By encouraging their preference, TfL effectively halves the capacity of the escalator in question, and creates significantly more crowding below, slowing everyone down. When you allow for the typical demands for a halo of personal space that persist in even the most disinhibited of commuters — a phenomenon described by crowd control guru Dr John J Fruin as "the human ellipse", which means that they are largely unwilling to stand with someone directly adjacent to them or on the first step in front or behind — the theoretical capacity of the escalator halves again. Surely it was worth trying to haul back a bit of that wasted space. Convinced? Even if it might work, theoretically, the real challenge is getting frantic passengers to agree with you. Japan has instituted a similar policy called "Don't Walk, Stand Where You Like". The London experiment was, in fact, inspired by Hong Kong, where the message to passengers was that standing was best for safety reasons. The system claimed to see a decrease in accidents (apparently a bunch of people get seriously hurt every year by other fast-moving people in train stations?). But what kind of message would work in London? TfL still isn't sure. Although I might buy the safety argument, I don't think this would ever ever ever ever happen in some other countries. It seriously sounds crazy to have someone standing there to "make" people stand, hologram or human. I mean, THEY CAN'T STOP YOU FROM WALKING, right? I'd refuse to just stand there, lol. I hate people that don't move to the side when on an escalator, I'm always walking on one. It's not a ride! Which is what the Mrs yells. This also doesn't take into account people who have other trains to catch or places to rush to. yeah, 31 extra people per minute is good but if 15 of those people need to be somewhere that necessitates them moving faster they're going to get there slower because they can't move up the escalator. The current system allows you to choose whether you need to get up or down quickly or slowly which wouldn't be the case in the "always just stand" situation and I think you'd find people would be in a rush and would miss trains/buses more often because they're stuck behind others. This sounds like that attempt to improve loading of airplanes by doing alternating rows - it assumes everyone understands what to do and will ignore their human nature. Where's the data from how much faster it is if they all were moving?